Three years have passed since “Cosmic Gateway To Infinity” and after a couple of shakes in the lineup (involving both guitar and bass), Italian Thrashers ANCIENT DOME are back with this “The Void Unending”, out for Punishment 18 Records. Opener “Target: Unknown” in an atmospherics intro building up momentum for “Black Passage”: heavy guitars lead a slow way to build up cruise speed and rhythm, where the listener is welcomed by shattering heavy riffs. Title track “Void Unending” starts from this reached intensity for its next attack, where ANCIENT DOME’s American trash veins are fully exposed. Guitar stabbing won’t stop with “IV – Logic of Nonsense”, lifting things up with heave riffing once again. This descent into heaviness progresses along with the next tracks, leaving freedom to ANCIENT DOME to launch themselves into showoff guitar solos. “Panic Generator” is a blazing blend of heavy trash laced with more traditional influences. “The Rules Of Hate” is a brutal storm ready to explode with unstoppable speed. “Fifth Dimension” as an instrumental interlude looks from a distance as the time to catch some air but that’s the opposite: catchy rhythm will take you along. Reaching the six minute goal, “D.I.E. (Droids In Exile)” is a mid-tempo-ish energetic tracks but it won’t fully abandon trash tempo, with bursts of speeding riffs. LP closes thumping and trashing with “Chain Reaction”, a proper closing track in line with the rest of this release. 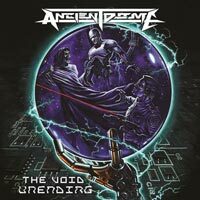 “The Void Unending” is an honest and pleasant release, able to make listeners go into headbanging bursts: in another time, in another place, different from current Italy ANCIENT DOME may have reached in their 17-year career much more deserved visibility.